20m Component Video Cable, double shielded, gold plated contacts, metal connectors. 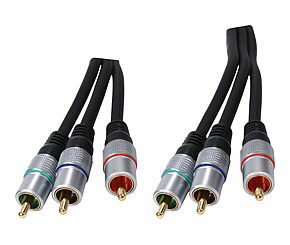 High quality Component Video Cable, featuring 3 colour coded RGB (Red, Green & Blue) phono connectors each end. Component video cables carry video only, sockets will be marked YUV, YPrPb or YCrCb. Our component video interconnects are made from high quality cable and feature attractive metal body plugs with gold plated contacts. 3.5mm Jack Plug to Phono Cable 20m Premium. 20m 3.5mm jack plug to 2x phono cable. 3.5mm stereo jack plug to 2x phono plugs / RCA plugs. Gold plated connectors. 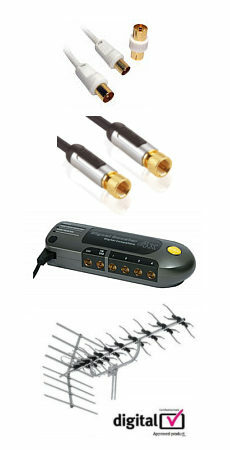 Ideal for connectin an ipod or MP3 player to a hi-fi or car audio system with phono / rca inputs. Length 20m.